Rock Jacket® is a system that was developed to offer excellent mechanical protection to the anti-corrosion coating and the steel pipe of onshore pipelines with the lowest total installed cost, installation time and environmental impact in the industry. Rock Jacket® is a plant applied reinforced concrete pipe coating developed for rocky terrain, rough terrain configurations such as steep slopes and for road and river crossings. 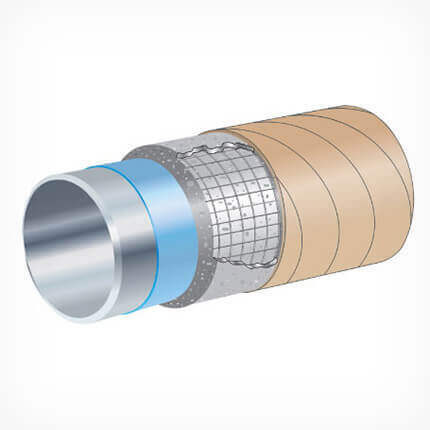 It has been designed to be buried directly in blasted out rock trenches without the use of other costly protective products and is ideal for both small and large diameter pipelines. To purchase the Rock Jacket® product, please call 281-886-2374. As density and compressive strength are design variables for Compression Coat, the values above are given as a general guideline. Values shown are typical and may vary from plant to plant. Please consult Shawcor for special requirements. * For D/t up to 80; for D/t between 80 and 100, 1.2° per pipe diameter; for D/t >100, 1.0° per pipe diameter. ** Characteristic proctor cylinder compressive strength. † Standard value; density can vary from 1760 kg/m3 (110 lbs/ft3) to 2560 kg/m3 (160 lbs/ft3) depending on the end use requirements. †† Larger diameters may be possible.